If you think chicken is boring, you just need better recipes! Here are 20 delicious options that are easy to make and oh-so-tasty. Chicken breast for dinner again? 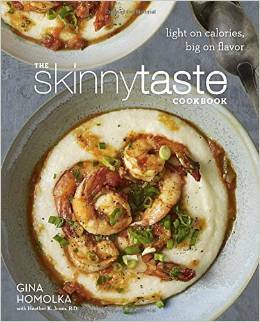 If you read that with a tone of disappointment instead of excitement, you definitely need to keep this collection of recipes on hand. Just because white chicken has a mild flavor doesn’t mean it has to taste bland. This lean meat is versatile to pair with almost any other ingredient, from the tried and true to the downright unusual. For example, if you’re used to ordering greasy orange chicken, try citrusy grilled mojo chicken instead. 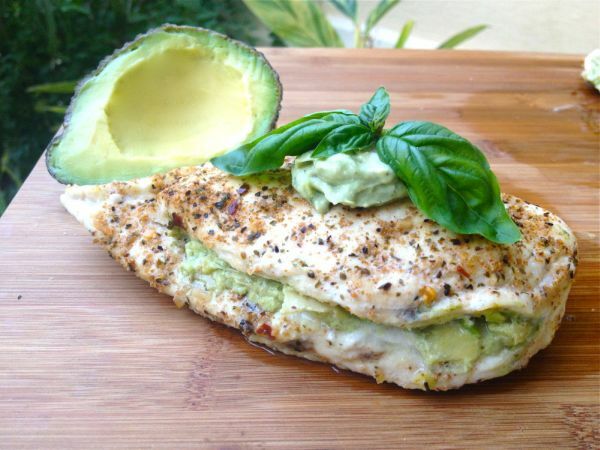 For a unique twist on surf ‘n’ turf, double up on proteins with crab-stuffed chicken breast. There’s also endless inspiration to be sourced from around the globe, including chicken tamale pizza, almond-crusted schnitzel, and slow-cooked coconut cashew chicken. 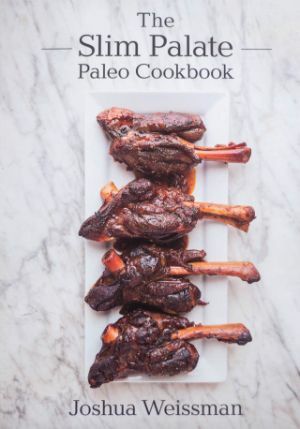 This recipe is from The Slim Palate Paleo Cookbook by Joshua Weissman, and whether you follow the Paleo diet to a T – or not at all – this collection has breakfasts, entrées, stews, vegetables, and even desserts to fit into your healthy eating plan. Other must-try recipes include grilled citrus-mustard split chicken breast, roasted garlic soup, and cauliflower tortillas. 2. In a small bowl, mix together the red pepper flakes, paprika, cumin, ginger, coriander, black pepper, saffron, and Himalayan salt. Set aside. 3. Cut the chicken into pieces (bone-in breasts cut in half crosswise, legs, thighs, and wings). Pat dry, and sprinkle with salt and pepper. 4. Set a large Dutch oven over high heat, and melt the ghee. Add the pieces of chicken a few at a time, being mindful not to overcrowd the bottom. Cook until crisp and golden, about 4–5 minutes per side. Remove the cooked chicken to a large bowl to collect the juices. 5. Once the pieces are browned, reduce the heat to medium, and add onion and garlic. Cook for 2–3 minutes, or until onion starts to soften and turn translucent. Add the spice mix, and continue cooking for about a minute, stirring constantly to avoid burning. 6. Add the water, and scrape the bottom of the pan to detach every little bit of crisped fat flavor. Bring to a simmer; then add the pieces of chicken back in. Don’t forget the meat juices! 7. Add olives, sprinkle with half the cilantro and half the parsley, and then squeeze the juice out of one of the lemons. Put the lid on, and place in the 350°F oven for an hour. 8. 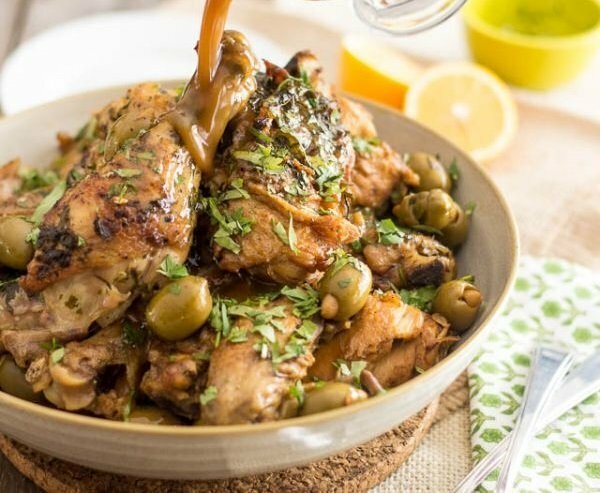 Remove the chicken and olives to a large shallow bowl or plate, and place in the oven to keep warm. Turn the oven off. 9. Strain the cooking liquid through a fine mesh sieve directly into a medium saucepan. Squeeze in the juice of the remaining lemon. 10. Dilute the tapioca starch in 2 tablespoons of water, and pour that into the simmering cooking liquid. Bring back to the boil, and cook for about one minute, whisking constantly. 11. Serve the chicken with the thickened braising liquid poured over the top. Putting chicken on pizza was once a novelty, but now it can seem as plain as eating unseasoned chicken breast. 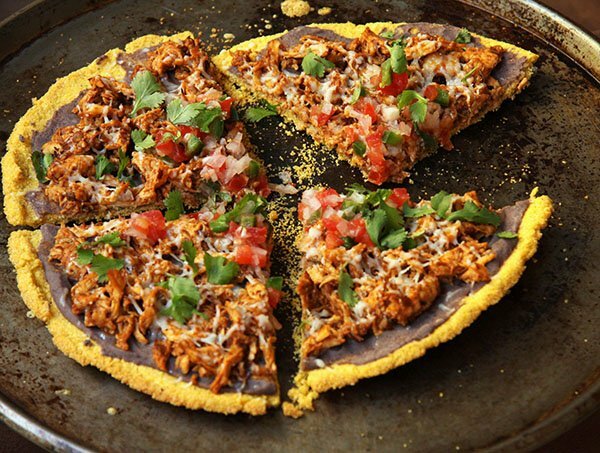 But this chicken pizza is all kinds of creative with a base layer of masa (or cornmeal), sauce made of black beans, and shredded chicken with pico de gallo. Each slice is bursting with fresh Mexican flavor. Top with cotija, if you can find it, and chopped cilantro. 1. Preheat the oven to 375°F. Spray a pizza pan or cookie sheet with olive oil. 2. Whisk cornmeal, salt, pepper, and oregano together in a mixing bowl. Add egg and water, mixing until it sticks together. (It will not be the consistency of regular pizza dough, but should not be crumbly either.) Spread on the pizza pan, keeping it about ½” thick. Spray the top of the crust with olive oil. 3. Bake for 15 minutes, or until the edges are light brown. 4. While pizza is cooking, toss chicken in enchilada sauce to coat evenly. 5. Remove pizza after 15 minutes, and use a spatula to make sure the pizza crust is not stuck on the pan. Place the toppings on the pizza in order: refried beans, shredded chicken, and cheese. Bake for another 5 minutes. 6. Remove from the oven, and let cool for about 5 minutes. Garnish with pico de gallo and fresh cilantro. Cut into four large slices, and serve. Ditch the canned cream of mushroom soup. It’s so much more rewarding to prepare chicken breasts with fresh mushrooms, garlic, and rosemary. Dinner will be ready in about a half hour, and because you’re skipping the premade ingredients, you can make this creamy dish dairy-free if you desire. 1. Heat a large non-stick skillet or cast-iron pan to medium-high on the stove. Melt a tablespoon of butter, and add the sliced mushrooms, spreading around the pan evenly so they can brown. 2. Once mushrooms have browned on one side, add in the chopped rosemary. Cook down the mushrooms. In the last few minutes of cooking, add the chopped garlic. Season with salt & pepper if using. Remove the mushrooms from the pan, and set aside. 3. To the same pan, add in the chicken breasts. Season lightly with salt & pepper, if using, and brown on both sides (about 5 minutes each side). Remove chicken breasts from pan and set aside on a plate. They won’t be cooked through yet, that’s ok.
4. To the same pan, add the other tablespoon of butter and a tablespoon of flour, and whisk it together to make a rue. Cook the butter and flour together for about 20 seconds on medium/high heat. Then slowly add the can of coconut milk while whisking. Once it’s thickened, add back the mushrooms, and then also add back in the chicken breasts. 5. Allow it all to simmer together on low/medium heat for another 6–7 minutes flipping the chicken occasionally until the chicken breasts are cooked through. Serve, and pour extra sauce over the top. Orange chicken is a classic pairing, but it gets a health upgrade in this recipe. 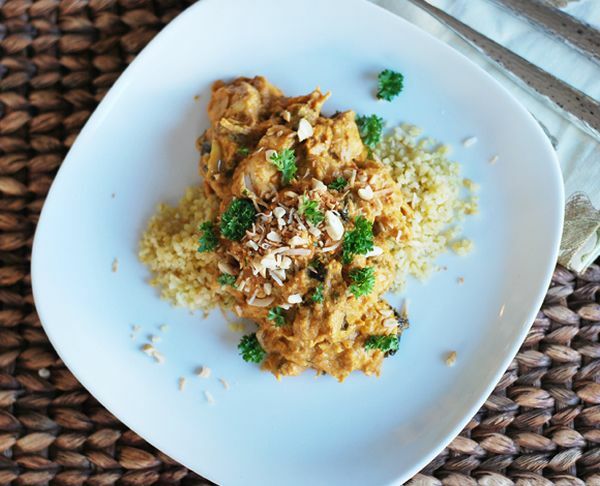 The dish is packed with nutrients thanks to two kinds of vitamin-rich fruit, two kinds of herbs, and cumin for digestive, immune-boosting, and respiratory health benefits. Even common garlic has disease-fighting powers as a natural lipid-lowering, anti-cancer, antioxidant, anti-microbial plant. 1. In a small bowl, whisk together the orange juice, lime juice, olive oil, oregano, parsley, cumin, minced clove, and salt to make the sauce. Set aside. 2. Butterfly chicken breasts, and pound down to an even 1/3” thickness. Add to a medium bowl or large zippered plastic bag, and pour half the Mojo sauce over as a marinade. Cover or seal. Cover the sauce as well, and refrigerate both for at least 2 hours. 3. Heat an outdoor grill to 400°F, or an indoor grill pan to medium-high. 4. Remove the chicken from marinade, and discard the liquid. Season chicken with pepper. 5. Grill chicken for approximately 4 minutes on each side, or until no longer pink in the center. 6. 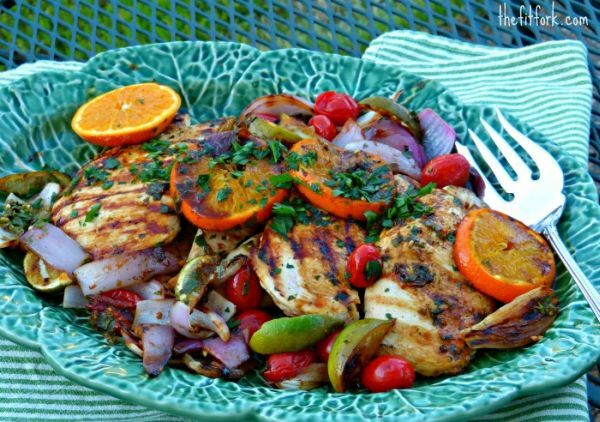 Remove chicken from the pan or grill, and add limes, oranges, and onions. Grill for 3 minutes, stirring occasionally. Add tomatoes to grill for another 1–2 minutes, until softened but not popped. 7. Serve all together, drizzled with the reserved Mojo sauce. Everything is better with peanut butter, and yes, that even applies to chicken! No doubt this dish is unique with Parma ham, PB, and pineapple making the chicken as moist as it is tender. The combo is a little salty, a little sweet, and a lot delicious. Serve with simple sides – trust me, you won’t need more flavor on the plate. 1. In a bowl mix the peanut butter, pineapple and the leaves from half of the thyme together to form a paste, use a little of the pineapple juice if the mixture is a little stiff. Season and set aside. 2. Put the chicken breasts on a board and with a sharp knife cut a slit to form a pocket. Spoon in a tablespoon of the peanut butter mixture into the pocket and then smooth the top side over to seal. Repeat with all four chicken breasts. 3. Wrap each breast firmly in Parma ham, and then place in a roasting dish and drizzle liberally with olive oil and season with salt and pepper. Bake in the oven at 400°F for 25–30 minutes until sizzling, golden and cooked through. 4. Serve with hot buttered potatoes, green vegetables and cranberry chutney or red currant jelly (not included in nutrition facts). If you keep stuffed chicken breast in the freezer, you’re doing yourself (and your diet) a disservice. 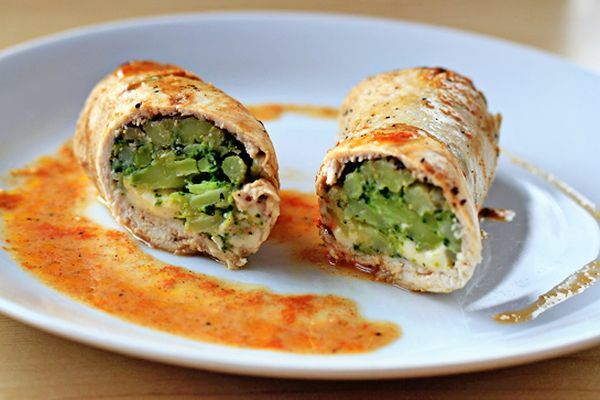 The hardest part about making them from scratch is pounding the chicken breast flat, but after that, it’s easy to fill them with your favorite veggies and cinch them together. 1. Chop the broccoli into small florets. Bring a pot of salted water to boil, and cook the broccoli for about 5 minutes. Drain, rinse with cold water, and set aside. 3. Working one at a time, place each chicken breast between two sheets of plastic wrap, and pound to be evenly thin. Remove the top wrap to season the meat with salt, cayenne, and black pepper. 4. Cut an ounce of cheese into pieces, and arrange near one end of the meat. Place a mound of broccoli (3–4 tablespoons) on top of the cheese. 5. Use the remaining wrap to assist in rolling the chicken breast to form a tight roll around the stuffing. Secure each end with a couple toothpicks, and use one to close up the seam. 6. Repeat above steps to assemble the remaining three chicken breasts. 7. Pour 2 tablespoons of oil in a skillet, and place over medium heat. Once hot, sear the rolled chicken on all sides until white in color (about a minute per side). This will help keep the juices in while baking. 8. Brush a baking pan with oil, and place the rolls inside, seam-side down. Bake in the preheated oven for 30 minutes. 9. Shortly before the chicken is done, prepare a light gravy. Add the milk, broth, pepper, paprika, and garlic powder into the pan where the chicken was being seared. Cook, stirring frequently, for about 5 minutes. 10. After taking the chicken out of the oven, transfer to serving plates. Remove the toothpicks, cover with gravy, and serve. This is a great dinner whether it’s your first time cooking, or you’ve got culinary experience but are short on time. It takes a few minutes to prep the sauce, but then it just gets poured over the chicken breasts before they’re thrown in the oven. About an hour later, you’ll be rewarded with a low-fat entrée that doesn’t sacrifice flavor. Serve with brown rice or fried cauliflower rice. 2. Place the chicken breasts into a sturdy baking dish (preferably non-stick). 3. In a large measuring cup, mix together the honey, mustard, water, ginger, crushed garlic, and cayenne. Cover and shake, or stir with a whisk to combine. 4. Pour the sauce over the chicken breasts, easing them up slightly so the mixture runs underneath the meat. 5. Season with salt and freshly ground black pepper, and bake in the oven for 45–60 minutes. 6. Transfer each chicken breast to a single plate, and drizzle sauce over top. Garnish with chopped parsley, and serve. This popular way to prepare a healthy battered chicken breast is from The Skinnytaste Cookbook: Light on Calories, Big on Flavor. It looks familiar – better even than fast-food fried chicken – but comes complete with macros that are balanced for any diet. A serving, equal to two large drumsticks, has over 40 grams of protein but less than 10 grams of fat. 1. In a medium bowl, season the chicken with salt, paprika, poultry seasoning, garlic powder, and black pepper. Pour the buttermilk and lemon juice over the top, and cover to refrigerate for 6 to 8 hours, preferably overnight. 2. Preheat the oven to 400°F. Place a rack on a baking sheet and lightly spray with oil. 3. 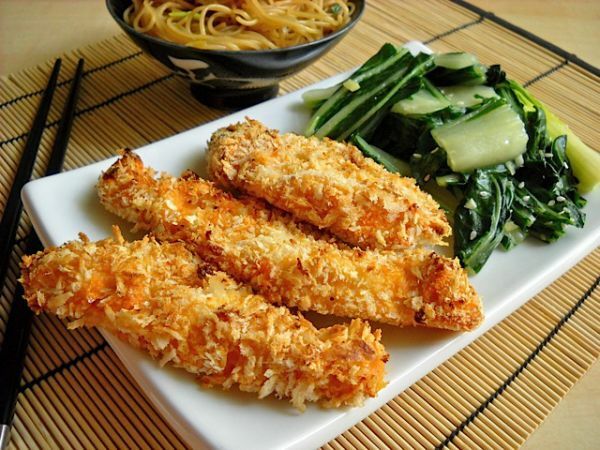 In a shallow bowl, combine the panko, cornflake crumbs, Parmesan, salt, parsley, onion powder, garlic powder, and chili powder. 4. Remove the chicken from the buttermilk, dredge each piece in the crumb mixture, and put the piece onto the prepared baking sheet. Spray the tops of the chicken with oil. 5. Bake until golden brown and cooked through, about 40–45 minutes. 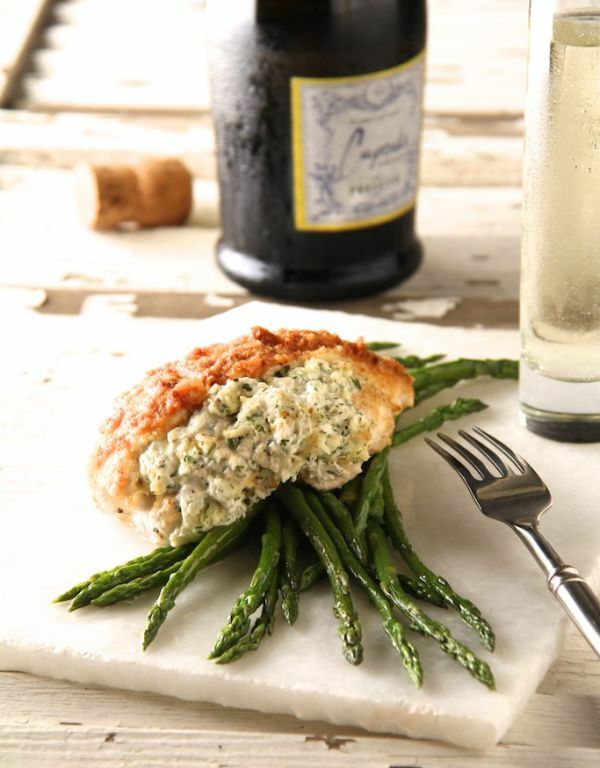 This incredible stuffed chicken breast is definitely decadent enough for a special occasion. But the filling is easy enough to mix together to have a nice night at home too. Either way, it might be useful to make it early in the day to pop in the oven just in time for dinner. 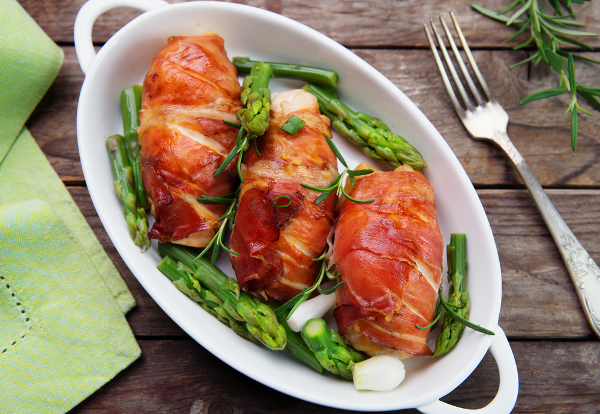 Assemble the stuffed chicken when you get a chance, and keep it ready in the fridge for up to 4 hours. 2. In a medium-sized bowl, combine the cream cheese, mayonnaise, minced scallion, chopped parsley, chopped dill, minced garlic, and lemon zest. Gently fold in the crab. Season to taste with salt and black pepper. 3. Cut horizontally through the center of each chicken breast, creating a pocket, being careful not to cut all the way through to any point. 4. Fill each pocket of the chicken with equal amounts of the stuffing. Secure with toothpicks. One at a time, dredge chicken in the breadcrumbs, and place on a baking sheet. Spray the coating with cooking oil to moisten. 5. Bake for 22–25 minutes, or until cooked through (165°F in the center of the filling). Remove toothpicks, and serve. This is an impressive way to serve chicken breast at a dinner party. It’s fancy enough, but with cottage cheese and avocados, it taste luxurious thanks to healthy fats. The cottage cheese also means it’s loaded with even more healthy protein. This dish is so filling with a wide range of ingredients, it almost doesn’t require a side dish! 1. In a high-speed blender or food processor, add avocados, fresh basil, cottage cheese, lemon juice, crushed garlic, black pepper, red pepper seasoning, smoked paprika, and ½ teaspoon of salt. 2. Stir in chopped artichokes, cover, and set the filling aside in the fridge. 3. Preheat the oven to 350°F. Take out the chicken breast, and cut the breast in half horizontally to butterfly it open, flipping the top to keep it in one piece. 4. Evenly divide the mixture among the chicken breasts, and fold the top half back over the filling to close. 5. In a shallow bowl, mix all the dried seasonings and salt together. Sprinkle rub mixture on each breast, carefully covering both sides, and place on a greased cookie pan. 6. Cook in the oven for 20 minutes, or until chicken is done. 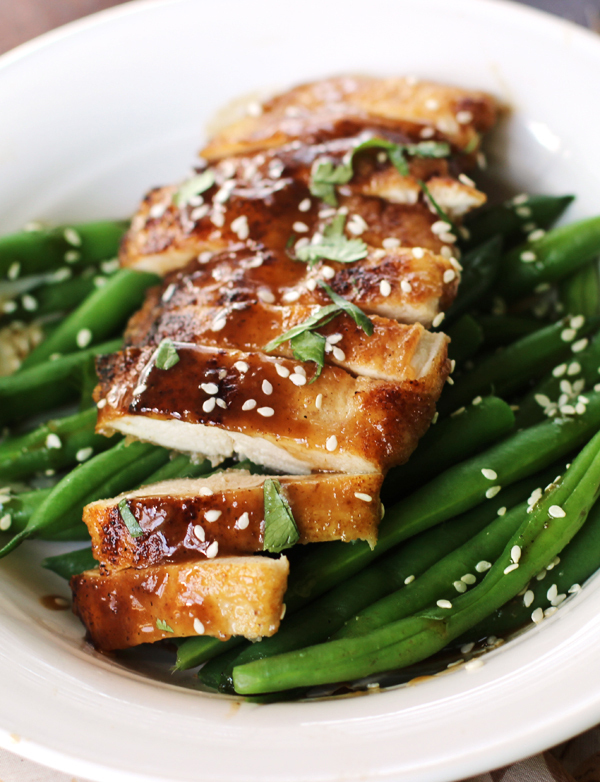 Marinating any meat in teriyaki sauce isn’t a lot of work – even if you choose to make it from scratch. But what makes this dish stand out is how it’s cooked in the pan with a medley of superfoods: kale, Brussels sprouts, and beets. 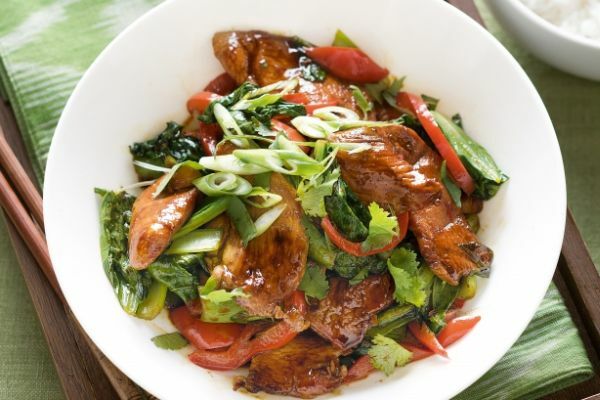 That’s a delicious East-West mash-up of flavors, but you can make this dish with your favorite Asian veggies like bok choy, Japanese eggplant, and Chinese broccoli too. 1. In a small saucepan, add the brown sugar, soy sauce, vinegar, ginger, garlic, pepper, and jalapeno (if using). In a small bowl, mix the water and cornstarch together. Add to the saucepan, and bring the mixture to a simmer. Then allow it to thicken about 4–5 minutes. Remove from heat, and let cool. 2. Add the chicken breasts to a large zippered plastic bag, and pour most of the prepared teriyaki sauce over the top, reserving some to serve with the finished dish. (Alternatively, use ¾ cup of premade teriyaki sauce.) Turn to coat completely, and let marinate in the fridge for at least 2 hours (up to 2 days). 3. About a half hour before dinnertime, prep the salad by mixing together the kale, Brussels sprouts, beets, and sesame dressing. Set aside. 3. Heat a large skillet over medium-high heat and add the olive oil. Salt and pepper the chicken breasts and when the oil shimmers, add them to the pan. Cook for about 2 minutes, turn them over and cook another 2 minutes. Transfer the chicken to a plate. They will not be cooked through at this point. 4. Add the onion to the pan (along with a little more oil if the pan is dry). Sauté the onion for about 2 minutes, or until it is soft, and then add the salad to the pan, tossing to mix. Add the chicken broth, and bring it to a simmer. 5. Nestle the chicken back into the pan, cover, and cook on low heat for 15 minutes. You’ll know it’s done when the chicken is cooked through and vegetables are tender. Season with salt and pepper to taste, and serve with a sprinkle of sesame seeds. If you’re looking for an inventive springtime flavor combo, try this recipe with rhubarb. That’s right – it’s not just for strawberry pie! It’s easy to slice it up and throw it into a chicken stir fry. The bitter, earthy flavor adds an intriguing element to the fresh ginger and other common stir fry ingredients: snow peas, broccoli, onion, garlic, carrots, and soy sauce. 1. Combine the rhubarb, sugar, and water in a sauce pan. Cook over medium heat until just barely tender, about 3–5 minutes. Stir constantly in the beginning so that the sugar doesn’t burn. Remove from heat, and set aside. 2. In a small bowl, mix together the rice wine vinegar, soy sauce, cornstarch, and sesame oil (if using). Set aside. 3. Heat a wok, or large sauté pan, over high heat. Add 1 tablespoon of vegetable oil, and when heated, add the chicken. Cook until chicken is done, stirring only occasionally, about 3–4 minutes. Remove from wok, and set aside. 4. Add another tablespoon of oil, and cook the carrots and onions for 3 minutes, stirring constantly so they don’t brown. Add the broccoli, and cook another 2–3 minutes. Finally, add the snow peas, red bell pepper, ginger, and garlic. Cook for another 3–4 minutes, stirring constantly to ensure the garlic and ginger don’t burn. 5. Return the chicken to the wok, and heat for one minute. Add the rhubarb, along with the liquid it was cooked in, and the vinegar-soy sauce mixture. Cook until sauce thickens and all ingredients are warmed through. 6. Serve with rice (not included in nutrition facts). Afraid of making chicken curry? Layering all those flavors together can get complex – unless you use a slow cooker! This is one of those one-pot dinners that you can stir, set, and forget. If you put it all together in the morning, you’ll be rewarded with a healthy, delicious dinner. 1. Cut the chicken into small pieces, and place them in the slow cooker with the onions. Season well with salt and pepper. 2. To a blender or food processor, add the coconut milk, ¾ cup cashews, tomato paste, garlic, soy sauce, garlic powder, onion powder, turmeric, Worcestershire sauce, and tabasco. 3. 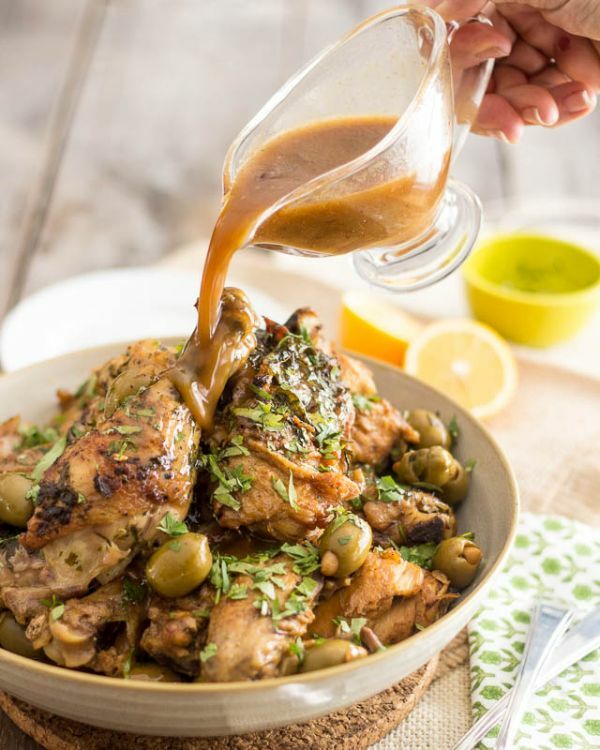 Pour the sauce over the chicken in the slow cooker, and set on low for 6–8 hours, or high for 3–4 hours. 4. Serve over your favorite grain, such as rice (not including in nutrition facts). Garnish with the toasted cashews. 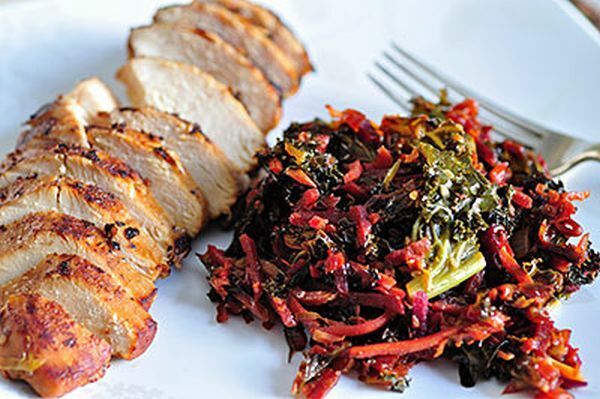 Low-fat dinners don’t have to be tasteless. 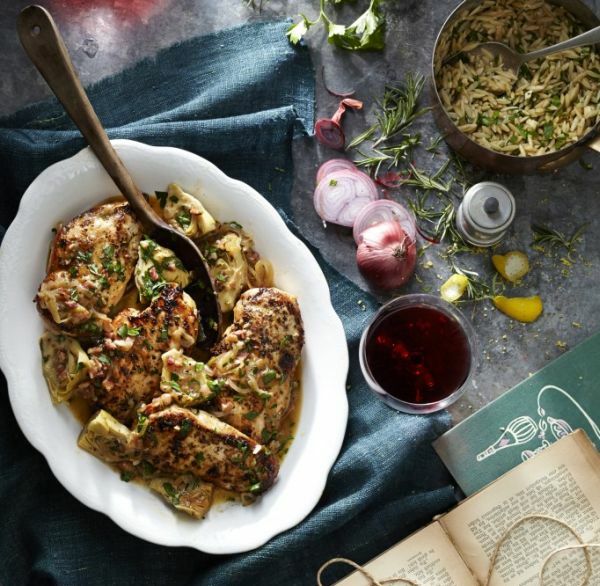 The robust artichoke sauce requires a handful of ingredients, but it’s worth the prep time for this take on chicken breast. To make it a little easier, use ½ teaspoon of dried rosemary instead of fresh. And if you don’t have shallots, dice up a small onion instead. 1. Combine stock and flour in a small bowl, stirring with a whisk. Set aside. 2. In a medium bowl, mix together 1 tablespoon oil, lemon zest, 4 teaspoons lemon juice, and garlic powder, stirring with a whisk. Add chicken; turn to coat. Let stand at room temperature 30 minutes. 3. Remove chicken from marinade; discard marinade. Sprinkle chicken evenly with salt and pepper. Heat a large skillet over medium-high heat. Coat pan with cooking spray. Add chicken to pan; cook 5 minutes on each side or until done. Remove chicken from pan. 4. Reduce heat to medium. Add remaining 1 tablespoon oil to pan; swirl to coat. Add shallots, rosemary, and pancetta; cook 3 minutes or until shallots are tender. Add garlic; cook 30 seconds. Add sherry to pan; cook 4 minutes or until liquid almost evaporates, scraping pan to loosen browned bits. 5. Stir in stock mixture; bring to a simmer. Add artichoke hearts to pan; cook 1 minute or until sauce thickens slightly. Stir in remaining 2 teaspoons juice and 2 teaspoons parsley. Add chicken to pan, turning to coat. Sprinkle with remaining 2 teaspoons parsley. 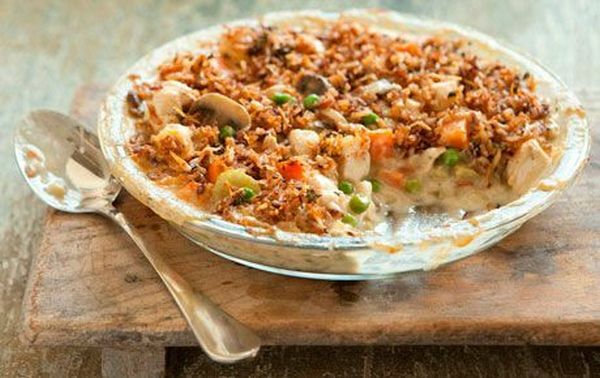 There’s nothing like chicken pot pie for dinner, but forget the pre-made, frozen junk. This recipe takes it easy on the butter and oil, keeping each serving under 10 grams of fat, including a sprinkle of cheese on top! This version of meat pie also sports a gluten-free crust, which uses brown rice instead of wheat flour. 1. Preheat the oven to 400°F. Lightly oil a 9-inch pie dish, and set aside. 2. Heat oil and butter in a large skillet over medium high heat. Add chicken and cook, stirring occasionally, until no longer pink, 4–5 minutes. 3. 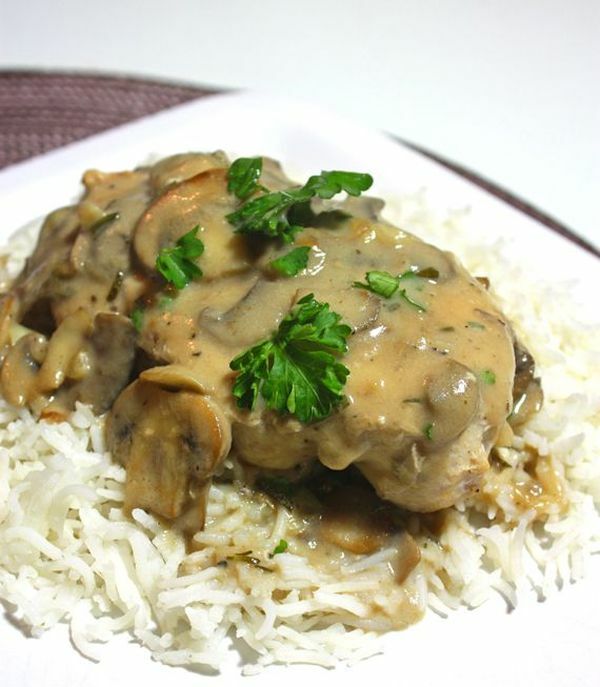 Add mushrooms, 1 teaspoon of the thyme, carrots, celery, onions, salt and pepper and cook until just tender, 6–8 minutes. 4. Add flour and cook, stirring constantly, for 1 minute. Add broth and milk, stir well, and bring to a simmer. Reduce heat to medium low and simmer until very thick, about 10 minutes. 5. In a medium bowl, combine rice, cheese, paprika, remaining 1 teaspoon thyme, salt, and pepper. Set aside. 6. Stir peas into chicken mixture then season with salt and pepper, and transfer to prepared dish. Scatter rice mixture evenly over the top, and then arrange dish on a baking sheet to catch any drips. Bake until bubbly and crust is crisp, about 30 minutes. Next time you want breaded chicken, try this trick instead. 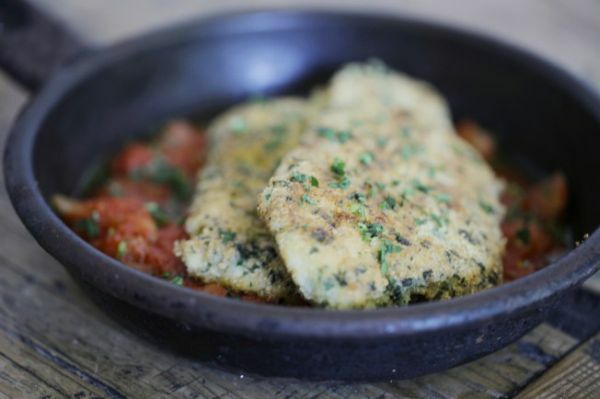 The resulting schnitzel is just as easy to make but even more rewarding to eat. 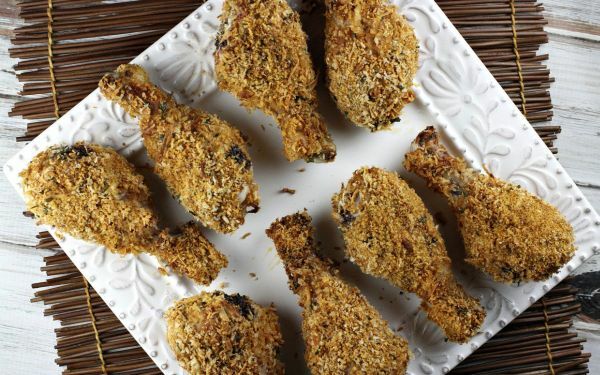 Ground almonds replace the traditional bread crumbs for a low-carb substitution. Plus, the almonds actually pack more flavor (and don’t forget protein!) so this healthy version is a win-win. 1. In a small bowl, combine almonds, zest of one lemon, and parsley. Set aside. 2. One at a time, lightly coat the chicken breast in the arrowroot, dip into the egg mix, and follow with the almond mix. Set aside on a plate as you continue dredging the rest. 3. Add 1 tablespoon of olive oil to a pan over medium heat. Cook the chicken breasts until lightly golden and cooked through. 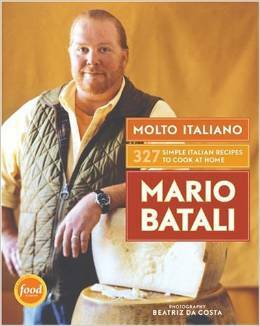 When you’re craving uncomplicated but high-quality Italian food, there’s no better chef to turn to than Mario Batali. For more delicious dishes like this, pick up Molto Italiano: 327 Simple Italian Recipes to Cook at Home. Learn to make Chicken in the Style of Canzano, Game Hen with Pomegranate, and Pork Loin in the Style of Porchetta. 1. Cook the asparagus in a large saucepan of salted boiling water until crisp-tender, 3 minutes. Drain and cool under cold running water; drain and pat dry. 2. Season the cutlets with salt and pepper and place 2 sage leaves on each cutlet. Wrap each cutlet in a slice of prosciutto, pressing to adhere. Spread the flour in a shallow dish. Dredge the chicken in flour, dusting off the excess; transfer to a baking sheet. 3. Set a rack over a baking sheet. Heat 2 tablespoons of the olive oil in a large skillet. Add half of the chicken and cook over moderately high heat, turning once, until golden and just cooked through, about 3 minutes. Transfer the chicken to the rack. Repeat with the remaining olive oil and chicken. 4. Add the vin santo and stock to the skillet and boil over moderately high heat until the liquid is reduced by half, 4 minutes. Whisk in the butter. Pour half of the sauce into a bowl. Add half of the chicken and asparagus to the skillet and cook over moderate heat until hot, 2 minutes. Season with salt; stir in half of the parsley. 5. Transfer the chicken and asparagus to plates and pour the sauce on top. Repeat with the remaining sauce, chicken, asparagus, and parsley. When you’re restricting calories for fat loss, chicken tenders are probably off the table. Well, bring them back with this low-fat recipe! And while you’re at it, may as well add one of the most craveable flavors: Sriracha! It only takes a quick extra step, and it’ll be easy on your wallet too. 1. In an airtight container, combine the Sriracha, rice vinegar, minced garlic, and grated ginger. Slice the chicken breasts diagonally into 6 strips each, and add the pieces into the mixture. Cover the container, and let marinate in the fridge for at least 1 hour. 2. Preheat the oven to 400°F. Line a baking sheet with aluminum foil, and set aside. 3. Set up a dredging station with three bowls. Fill the first with all-purpose flour. In the second, whisk an egg with a tablespoon of water. Finally, place the panko crumbs in the third bowl. Set aside a clean plate to hold the breaded chicken strips. 4. One chicken strip at a time, wipe off the excess Sriracha marinade. Then dip in the flour to coat, followed by the egg, and cover in panko crumbs. As you go, make sure all surfaces of the strip get covered. Gently place the breaded strip on the clean plate, and move onto the next one. 5. Place breaded strips on the foil-lined baking sheet. Bake for 20 minutes. Turn the oven to broil, and cook for 5 minutes. Watch the strips so that they become golden brown, not burned. Flip, and broil for another 5 minutes. 6. Let the chicken strips cool slightly before serving. Chicken doesn’t just have to be boiled, baked, or grilled. It’s also amazing and extremely simple to use as a base for a hearty stew. 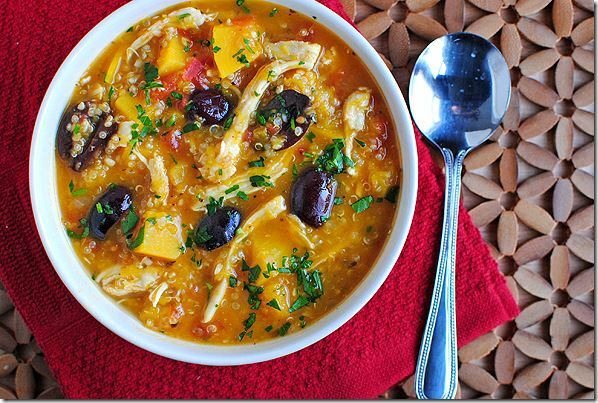 This one is rich with flavor from nutty squash and quinoa, plus salty olives and fresh parsley. It’s unlike any other stew you’ve had, but that doesn’t mean it can’t immediately qualify as a big bowl of comfort. 1. Place the butternut squash and a splash of water in a large bowl with a lid in the microwave, and cook until barely tender, about 6–7 minutes. Remove half of the squash, and set it aside. Cook the remaining squash an additional 3–4 minutes or until it is very tender. Drain, then mash this squash with the back of a fork and also set aside. 2. Add the chicken broth and chicken breasts to a large soup pot on the stove, and bring to a boil. Place a lid on top, lower the heat to medium-low, and simmer for 10 minutes or until chicken is cooked all the way through. Remove chicken to a plate to cool, and pour chicken broth into a separate bowl. 3. Return the pot to the stove over medium-low heat, and add in the olive oil. Add onion, salt, and pepper and sauté until the onion is soft and brown, about 10 minutes. Add garlic and oregano. Cook, stirring constantly, for another minute. 4. Add tomatoes and all the butternut squash to the pot. Stir to combine. Pour in reserved chicken broth and quinoa, and stir to combine. Bring to a boil then place a lid on top, lower the heat to medium-low, and simmer for 15 minutes or until quinoa is tender and cooked. 5. Meanwhile, shred the chicken. When quinoa is cooked, stir in chicken, olives and parsley. Cook until chicken is hot, season with additional salt & pepper if necessary, then ladle into bowls. 6. If making ahead of time, you’ll need extra chicken broth when re-heating as quinoa soaks up some of the broth as it cools. One of my favorite things to do with chicken breast is make a big batch in the slow cooker, oven, or boiled on the stove. Sounds like a boring way to prep meat? The secret is the heaps of shredded chicken that result, which means quick lunches on hand and less work for dinners. All you have to worry about is serving style: pick a grain like quinoa, a carb like tortillas (or a lettuce wrap), and a sauce or side dish to tie it all together. 2. Rinse the quinoa. Add the quinoa to a large pot with 2 cups of the water, 2 cup of low sodium chicken broth, and tomato paste. Stir the ingredients together with a wooden spoon. Bring the mixture to a boil, cover the pot and lower the heat to a simmer. Cook for 20 minutes, or until the quinoa has absorbed all of the liquid, is red in color, and is light and fluffy. 3. Season the chicken breasts with the kosher salt, freshly ground pepper, and cumin. In a large cast iron pan on medium heat, place 1 teaspoon of extra virgin olive oil. Sear the chicken on both sides for 3 minutes per side or until each side of the chicken is nicely browned. Add the remaining cup of water to the pan, and place the skillet in the oven. Allow the chicken to cook for 20 minutes, or until the breasts reach an internal temperature of 165° when tested with a meat thermometer. Set aside to cool. Once the chicken has cooled, shred it with your hands or with two forks. 4. In a food processor add the black beans, garlic, the diced jalapeño, one of the tablespoons of oregano and freshly ground black pepper. Turn the processor on and mix until a chunky paste forms. 5. Fluff the cooked quinoa with a fork and add a pinch of salt and pepper, and the remaining tablespoon of oregano. The quinoa should have a nice red hue. 6. To char the tortillas, turn on one of the burners on a gas stove. Using tongs, hold the tortilla over the flame until it begins to develop a nice char. If you do not have a gas stove, on medium high heat, place a grill plan on the stove, and grill the tortillas in the pan. 7. 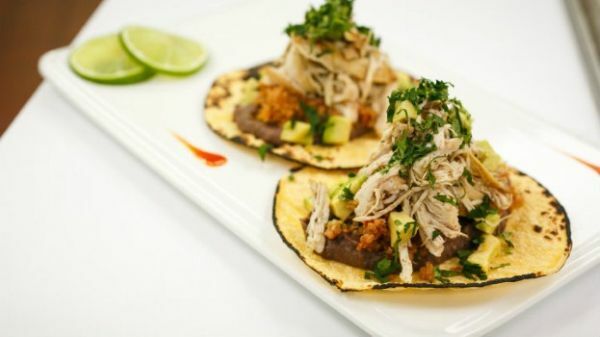 To assemble the tacos, spread 1 tablespoon of the black bean paste on the bottom of the charred tortilla, followed by 2 tablespoons of the quinoa and 2 tablespoons of the shredded chicken. Finish the tacos off with a slice of avocado and chopped cilantro. 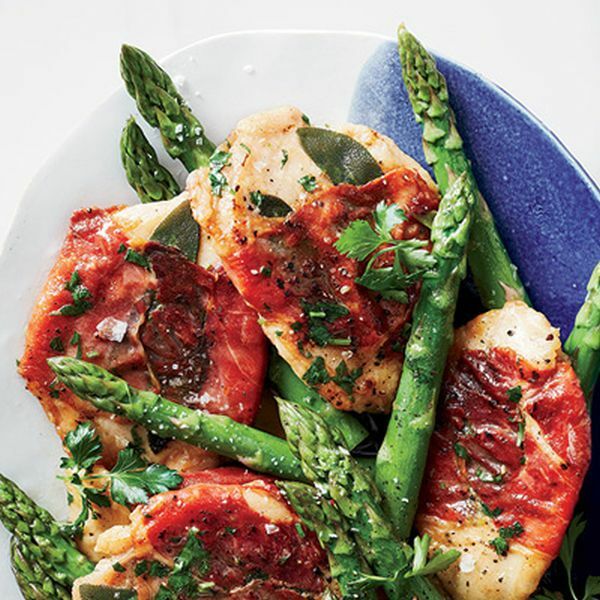 What did you think of these healthy chicken recipes? Have anything else to share? Let me know in the comments below!